Who would have thought that mac and cheese would evolve from the blue box to gourmet. Well I guess its not necessarily gourmet, but Elbows Mac n’ Cheese is trying to give untraditional mac and cheese a home. First, I need to set the story straight. I heard about this place a while ago, but because it’s in Brea and Cerritos I hadn’t checked it out yet. A few weeks ago, the restaurant reached out and asked me to come in and try it out, so I gladly went. However, I am all about honesty and only sending my readers to places worth your while, so this post is strictly the real deal. 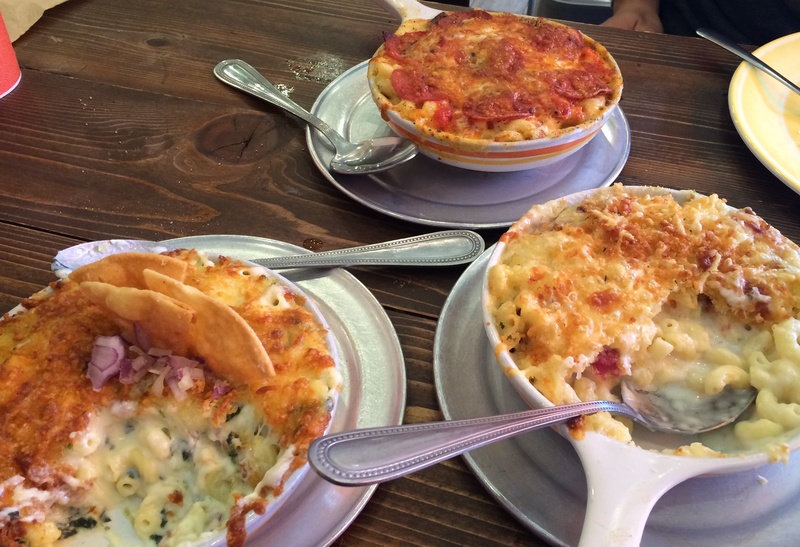 Elbows is a “fast casual” restaurant that serves different mac and cheese dishes and grilled cheese sandwiches. You order at the counter, and are served your food at the cute wooden tables. The restaurant in Brea is pretty small so you will be sitting quite comfortably next to your neighbors, but it isn’t communal style. We decided to get a nice assortment of cheesy deliciousness to try out. 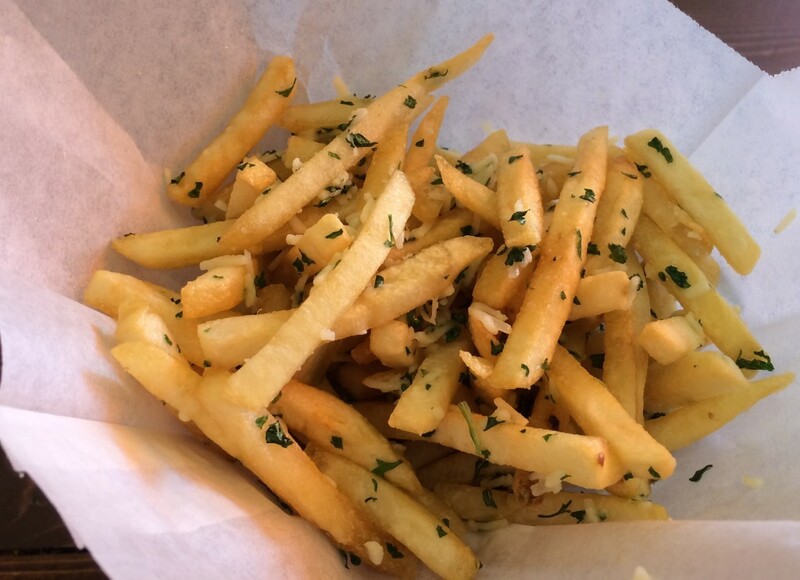 But first we started with some truffle fries because I mean, how could you not? They came out warm, not hot, and were kind of just squishy not crisp. It got worse because they weren’t seasoned well. I actually got up and had to salt and pepper them. I feel like I basically spit in the communion bowl. Pass on these. The best part of the meal was the okay dokey artickhokey mac and cheese. 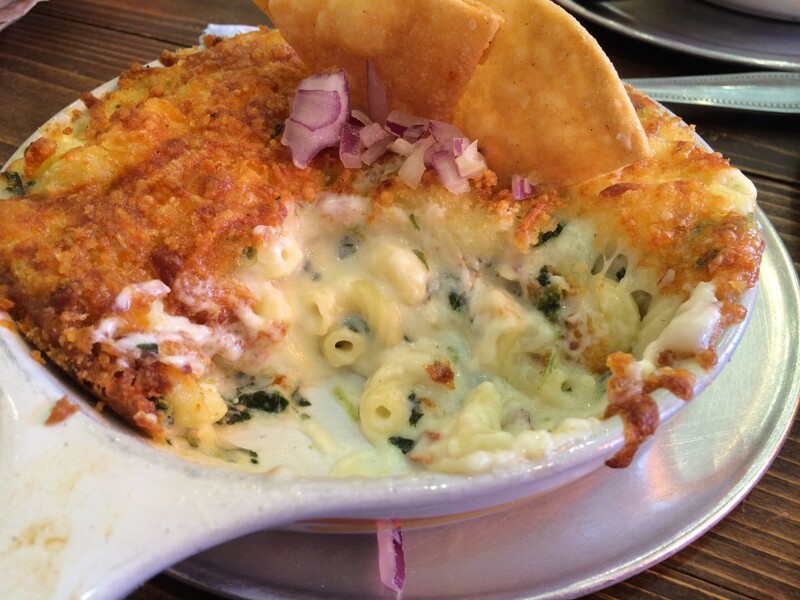 It is basically artichoke dip with mac and cheese. It was so good that my bestie who hates mac and cheese (a sin I know) ended up scarfing down my leftovers. The cheesy gooey part is amazing, but the best part is that Parmesan crust – it seals the deal. We also tried “When Pigs Fly.” This was really good – but when is bacon not good. Decent sized bacon bites with cheesy goodness, I thought this was a pretty good basic mac n cheese. It wasn’t too adventurous but it also changed up the traditional kraft box (which they also have). 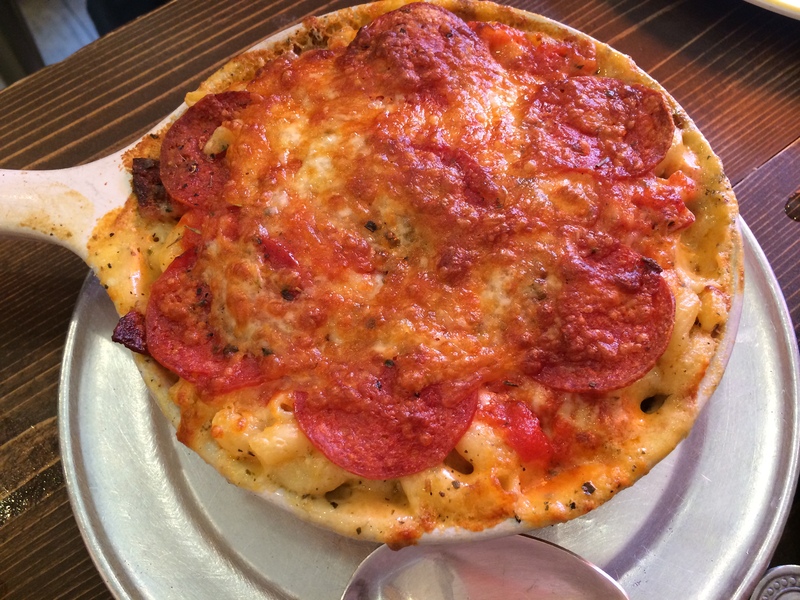 The last thing we ordered was the pizza mac and cheese. It was horrible. It tasted like a bad frozen pizza with random noodles. The marinara was so plain and the pepperoni was gross. I was seriously disappointed. Don’t even bother with that one. The saving grace of this place was the great service. While I know I received better service because I went for my blog, everyone was treated very well. They were extremely attentive and the food came out very quickly. They did not hesitate to make suggestions on dishes. The place was clean, and the menu was very extensive. 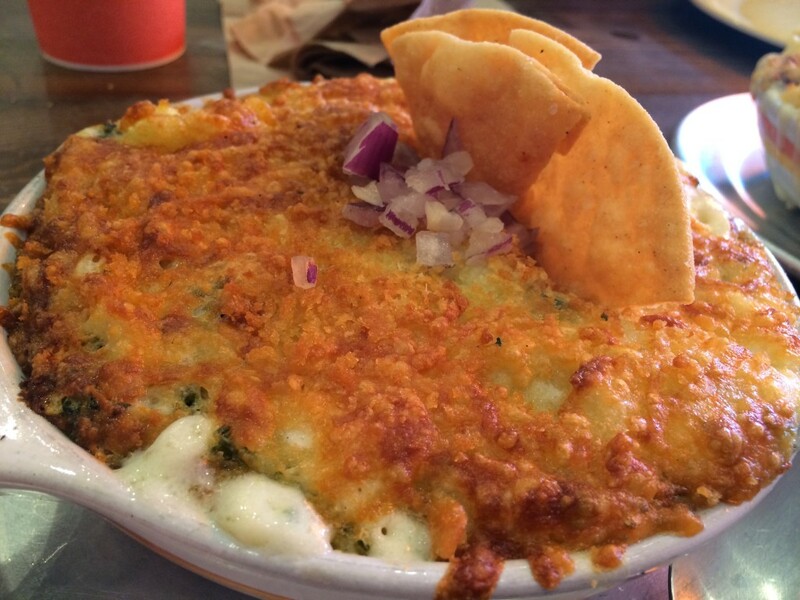 I give this place a 3.0/5.0 – great place for a quick, casual meal but there is just something about mac and cheese that makes me want a sit down, take your time kind of spot. Definitely will be coming back though! El ranchito still #1 place that’s not worth my time?! Rude. In my opinion it is terrible. But to each their own! I am sure there are places I love that you don’t agree with either. That’s the fun of eating out, everyone has a preference and an experience.